Welcome back! Your favorite part of your favorite day of the week has arrived – The Orchard’s Daily Rind is here to discuss a few of the newest albums, Out Today. This week’s featured releases include a new spin on the classic rock n roll sound, smooth and poetic beats from a R&B singer, and well-anticipated comeback album from all-girl Norwegian indie pop band. Find it here, on our weekly rundown. 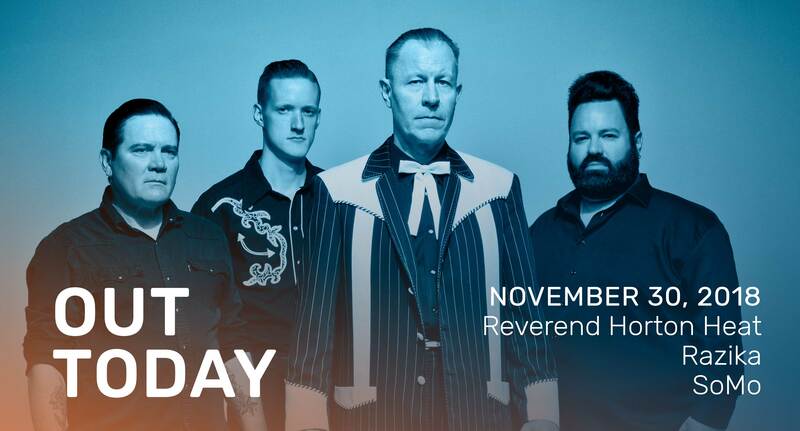 In between their nearly 200-show yearly tour, Reverend Horton Heat somehow managed to return home to Dallas to record a new eleven-track album for us – and we’re thrilled they did! Using vintage recording equipment to record material with new musicians in tow, the band, led by Jim Heath, has created in Whole New Life that Victory Records calls “a new twist on an old sound.” Heath claims this 12th release is his most positive material yet, focusing on “rock and roll but there is a human interest parallel – songs about growing up poor, vices, marriage, having children and walking the rapturous streets of America.” The title track highlights their upbeat rockabilly sound and is accompanied by a lively music video featuring the band, as well as a dancing chicken (to coincide with the song’s lyrics). Get moving and grooving with a Whole New Life, available now. Speaking of Texans, Joseph Somers-Morales, better known as SoMo, self-releases his new album A Beautiful November. The thoughtful Denison native shares a collection of powerful slow beats with his poetic R&B styling that will leave you longing for more. With previous tracks like “Ride,” which has earned over 85 million combined views on YouTube, SoMo has already gathered a great deal of followers eagerly anticipating new music. Each track tells a story dripping in emotion whether that be love or misery. The title does exemplify the album with a continued theme of mellow soulful romance sure to last through the winter. Listen to A Beautiful November now, just in time to reflect on the chilly month. Three years after their last record release, Razika is back in business with Sånn Kjennes Verden Ut. The 13-track album, which is the Norwegian band’s first release with their new label Jansen Records, showcases vulnerability and uncertainty. Returning to work with producer Matias Tellez since their debut album in 2011, Razika uses this album to touch upon life in a phase of transition, as well as choices and breaking out of known patterns. Musically, the album consists of slower pace, warmer production, and bigger sound – but still contains the vibrant sound authentic to Razika. With big hooks, more synths and nods to modern R&B, the band has created their finest album to date. Check out Sånn Kjennes Verden Ut, out now. That’s it for this week! Have a lovely weekend full of new and exciting music.